Wimbledon Village is charming, chic and can be a little expensive. I have no problem at all with pricey restaurant menus if the quality of the food warrants the cost to the consumer. But, in those ever-so chi-chi parts of London like Wimbledon, it’s easy to find you get the price tag without the quality. 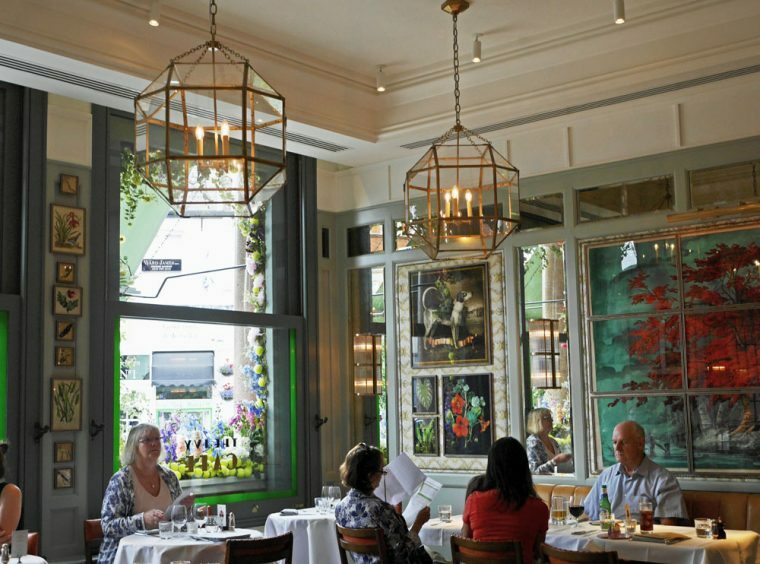 I’d hesitated a bit when I was asked to review the Ivy Cafe, little sister of the famous Covent Garden restaurant, and wondered if it might fall into that category. I also worried that visiting during the Championships would make the experience unpleasant – it was bound to be busy and I wondered whether the staff would cope. As it happens, my concerns proved to be unfounded and we’ll certainly be going back. We arrived early thanks to some overly efficient play at the Championships that day. 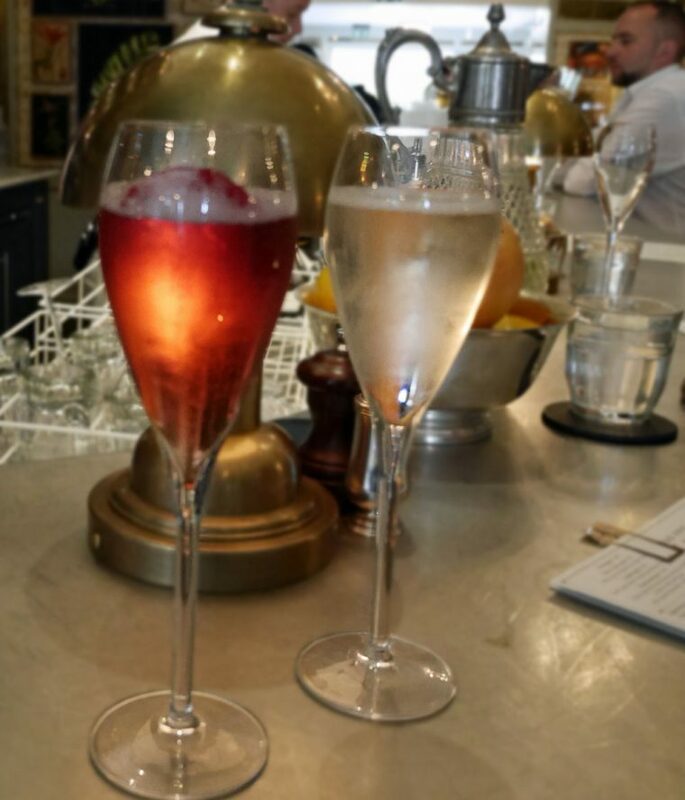 Sitting at the bar enjoying the Ivy’s ‘Cafe Royale – a mixture of gin, sloe infusion, rose water and cremant (£6.75) we noticed that although the place was busy, everything seemed to be running like clockwork. It was a fine evening and we asked if we could sit out in the pretty courtyard garden to the rear of the restaurant. I’d imagine it can get very popular – pretty, summery but with a retractable awning, wall heaters and rugs for inclement English weather. It was, however, a typical evening of the Championships weeks; cloudy and looking as if it might rain. It didn’t and we spent the whole evening there, though we did resort to rugs a bit later on. We picked a bottle of Gavi, Voltolino from Piedmonte to drink – at £27, a reasonable option. The Ivy has a reasonable number of wines by the glass if you prefer to match your wines and there are also some stunning cocktails, all under £10, some detox soft drinks and a few beers and ciders. My choice of yellowfin tuna carpaccio (£8.95) for a starter was partly driven by some kind of ‘I should eat healthy food’ moment. I might otherwise have ordered the crispy duck salad or even snacked on truffle arancini. I didn’t feel in the least bit short changed though when it arrived, a delicious light plateful of finely sliced ultra fresh fish with a delicate avocado cream and a light creme fraiche dressing. 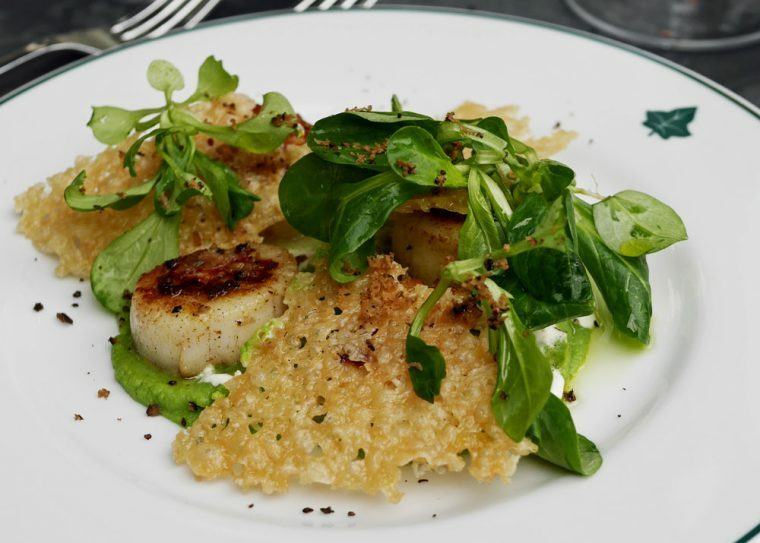 My companion’s seared scallops (£10.95) came with truffled pea puree, creme fraiche, lambs lettuce and a Parmesan crisp. 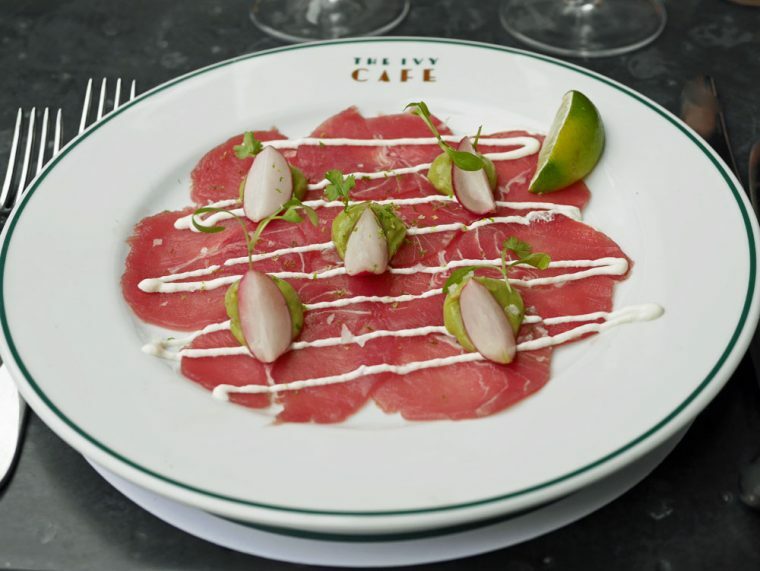 Main courses at the Ivy Cafe are very much ‘Grande Cafe’ style with a kind of healthy twist. There’s whole lemon sole, steak, egg and chips and salmon and smoked haddock fish cakes. 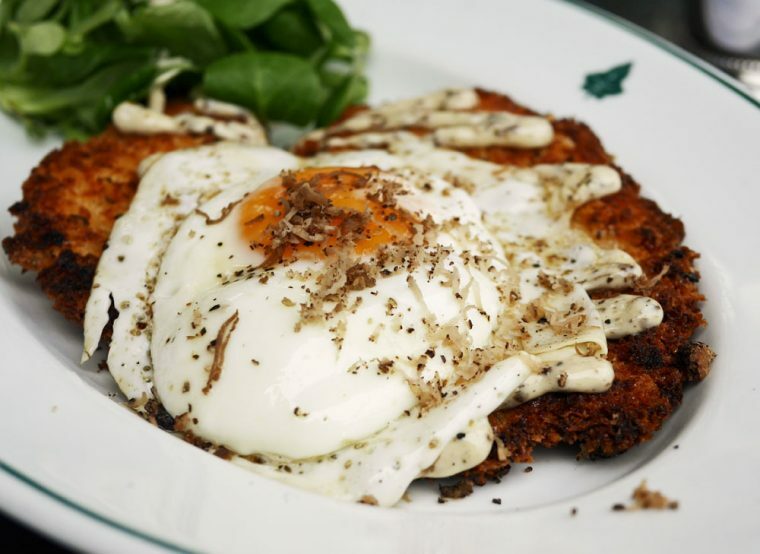 My companion chose one of the classics, the Chicken Milanese (£15.75) which came with a salad, black truffle mayonnaise and a fried egg. 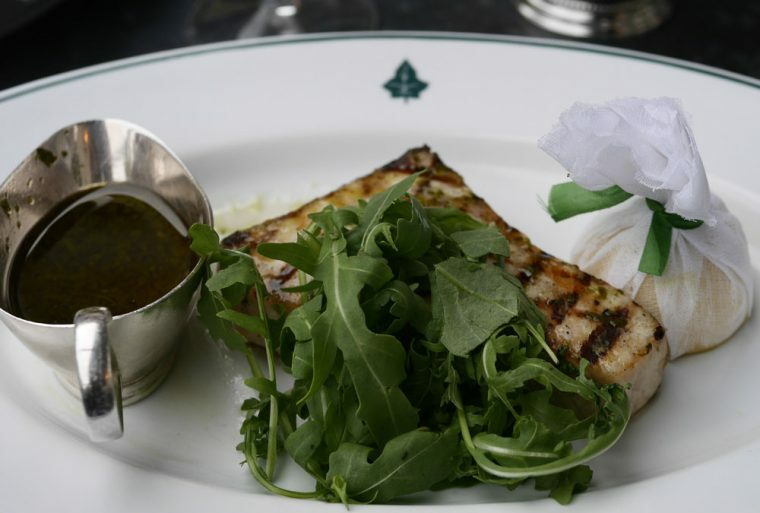 Still in pursuit of a healthy meal, I picked the line caught swordfish, with chimichurri dressing, lemon and rocket (£15.50). Nicely cooked with a good char and a and perfectly presented, the chimichurri was a good option as a dressing, though for my taste perhaps a little heavy on the olive oil. We moved onto the tricky subject of sides. Of course, what we should have done was stick to salad. But…something caught my eye. 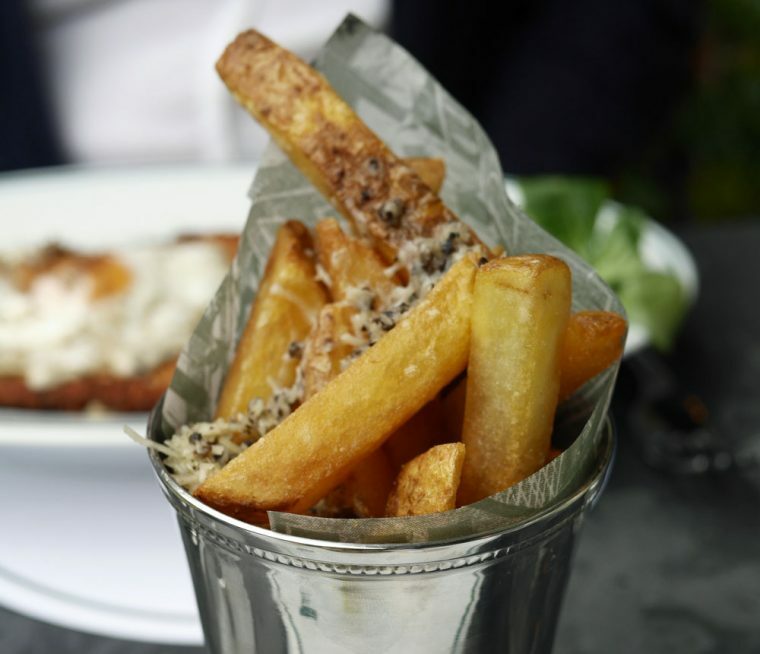 Truffle and Parmesan chips (£4.50). Regardless of the fact that the rest of the meal was really pretty good, I’d go back just for this. Of course I’d try something else…perhaps the fillet steak, or the roast salmon fillet. We ordered a second portion. I’m not entirely sure they were a sensible pairing with my swordfish, but I really don’t care! 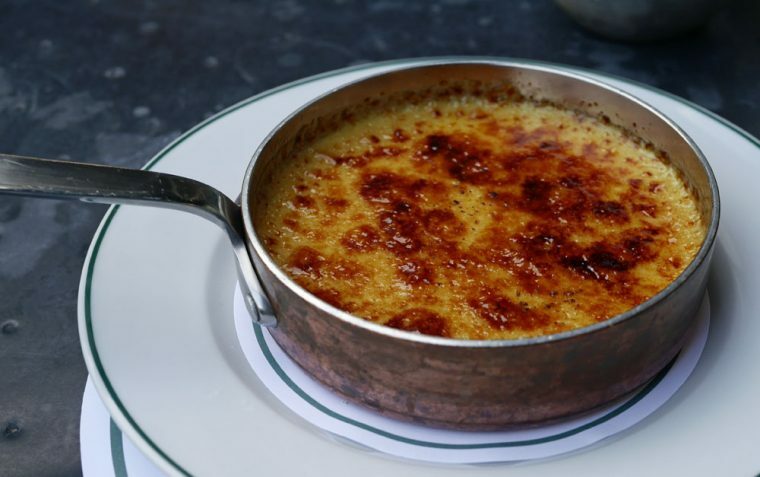 Having somewhat reneged on the idea of healthy eating I decided that creme brulee (6.50) was obviously the dessert of the moment. There’s nothing quite so comforting as a classic well done – and this was spot on. My companion meanwhile picked one of those options that is trying to be good, but just not staying on track. 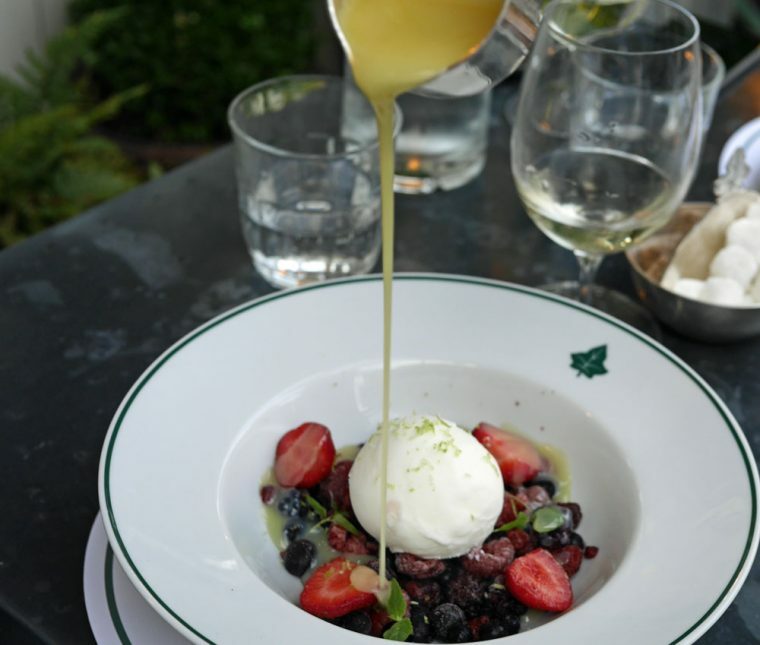 Frozen berries (£6.95) is a large bowl of healthy mixed berries with a presumably healthy yoghurt sorbet drenched in a warm white chocolate sauce which doesn’t even pretend to fit with a diet. But since we’d blown the healthy eating already on the truffled Parmesan chips, what would be the point of that? 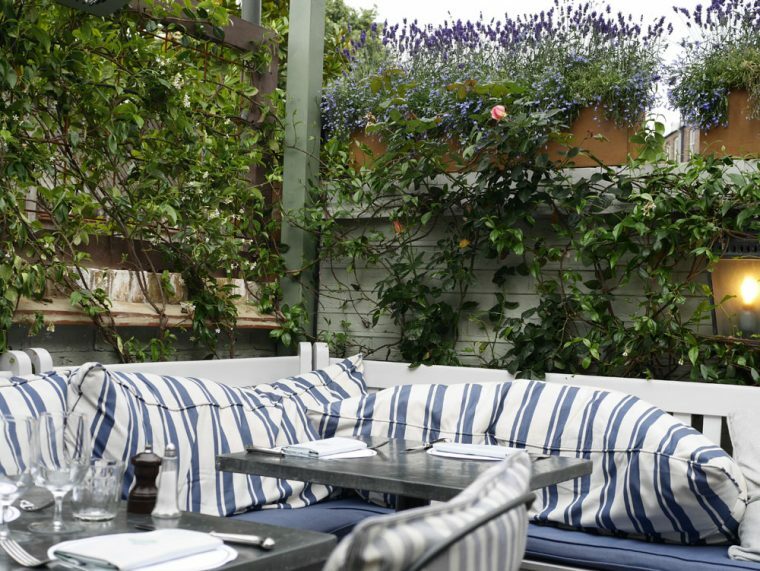 We both really enjoyed our visit to the Ivy Cafe in Wimbledon and we are both planning to return. It’s good to find somewhere serving excellent quality food at a reasonable price. What a terrific meal and in such a lovely location. That would be a real treat! We were really impressed – and hadn’t expected to like it so much! I do love that The Ivy has kept the beauty of their first branch throughout the new sister restaurants popping up!